A few years ago Elved sustained a terrible injury in a climbing accident in North Wales. He's been walking and rock climbing since but this was his first time ice climbing again. We will ease back into it gently this week and today we made a great start by climbing on the Carn Dearg Cascades. With strong gusting winds and rising temperature this was a smart place to go anyway. There were a few reports of cracks in the snow and avalanches being triggered so it was good to have nothing above us. We climbed two lines just right of The Organ Pipes and we abseiled off each time. 60m ropes are quite handy for this. The ice was nice, soft and plastic in the warmer conditions. It also stayed dry which was a nice surprise. Several teams turned back on the walk in but for those that persevered there was good climbing to enjoy. Steve went up Ledge Route and Hannah and Mark climbed Mega Route X. The Curtain also had a couple of ascents. Tonight's thaw will hopefully be enough to stabilise the snow after it freezes again later tomorrow. Let me tell you a story. Getting geared up and trying to get into the right frame of mind, something did not feel quite right. Not everything clicked into place as it needed to. I did not feel the calm commitment that I had felt before. So, instead of soloing Mega Route X, I went home to try to work out what was wrong. This was many years ago when I was young and bold. My friend Jonny and I had done many solo ascents of classic ice climbs. Most of the classic grade V climbs were already done and we were talking about what would be next. Mega Route X seemed to be the obvious choice but a competitive element crept into our discussions. It became a bit of a race to see which of us would be the first to solo the climb. Standing at the foot of the route, it did not feel quite right because of this competitive element. Instead of choosing to do the climb because it felt good and right on the day, it felt like I was doing it partly to get one up on Jonny. So I'm glad I went home that day. A couple of weeks later, having worked through all this and having lost the competitive edge with Jonny I went back and climbed it. My wife Louise was waiting in the coire and we went to climb Curtain Rail afterwards. It felt really good that day. So today was the second time I've climbed Mega Route X and it made a brilliant end to three excellent days of climbing with Abib. The first few metres are a little thin and steep but this is not unusual. After this it is fat and steep with good ice. 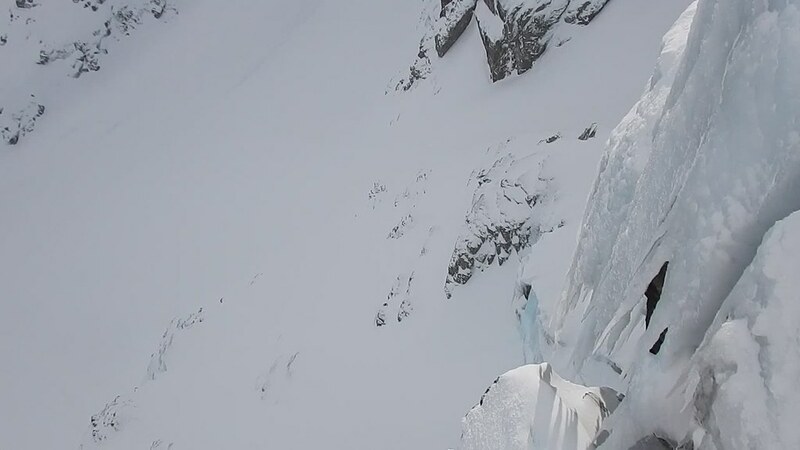 You need all your steep ice climbing techniques to manage the climb. Straight arm hangs, pelvis in and arch your back to get the weight onto your feet and keep your feet wide and your axes central. We climbed it in two pitches and abseiled all the way down in one go which is the common way to tackle it now. It is given V,6 but it feels a big step up from Vanishing Gully which is given V,5. It is an intimidating climb. From the coire it looks very steep indeed and it is only when you get a bit closer that it looks a bit more amenable. Even then, my poor forearms were giving up by the time I got to the top of the steep bit. The thought of soloing this climb now fills me with dread even if I had wrist leashes as I used back then. It does make the point that we should be very careful with our route choices and make sure the reasons for taking on a climb are good reasons. We do like to challenge ourselves but we should do a careful risk assessment before we go climbing. Are you good enough and strong enough? Is the climb in good condition? Is the weather good enough? We should not feel pressured into climbing anything because we want to show others how good we are, because it is so rarely possible or even because we are guiding and our clients want to do it. ​Today felt like fun. Hard work and scary but fun as well! Mega Route X is a brilliant climb and it always lives up to its name! Great weather and good climbing conditions continue on Ben Nevis. Abib and I went to see what the ice was like with a wee warm up on Vanishing Gully. As it was, another team got there just before us so we went to climb Gutless first. This side of Douglas Boulder is very icy which benefits Gutless. There are a couple of icy steps before you get into the chimney and the last groove to the big ledge is much more secure with good solid snow. With good protection, great moves and wild positions this is a brilliant wee climb. I think it's a shame there are quite a lot of fixed anchors on this route now from people abseiling down the climb so we tidied up what we could. We went over to the SW Ridge and abseiled down to the foot of West Gully of Douglas Gap. If you pass the sling I left behind please tidy it up too! Vanishing Gully was next and was great fun. I bashed through the ice to open up the cave for a more comfortable belay and found quite a bit of water still flowing through the snow and ice. This will be freezing over night so the ice at this level will still be growing. Vanishing Gully has had a few ascents this week and it is already stepped out with easy hooks for the axes. Surprisingly, the ice was not great for ice screws on the second pitch. I wonder if a lot of snow was blown up the gully as the ice was forming so it is a little cruddy. The Curtain was climbed by a few teams today as well as Jackknife, Fawlty Towers, Orion Direct and a few others. Large cornices are in place over east facing crags and gullies such as Number Four Gully. However, this now has a notch in the cornice and the gully was descended. The avalanche hazard is slowly reducing in the calm weather but it is still significant.